There was a storm warning and people were advised to stay indoors for their safety. But He got a call from office for an emergency call with client and he grumpily got ready, wore his rain suit and took his bike out. The storm was raging outside and it was threatening to rain anytime now. He started his bike and rode towards office. As soon as he reached the highway it started to rain and clouds started to roar. He was riding his bike slowly due to heavy rain and saw some brilliant lightning in the distance. Even though he was wearing rain suit the rain was too strong for any visibility and he stopped and got off his bike. He stood under a tree. Suddenly he heard huge roar of clouds just above him and the tree was struck by lightning. Both were instantly burned to a crisp as billion volts of electricity passed through them. He sure was surely unlucky but his path to death lead him to where he had to be. 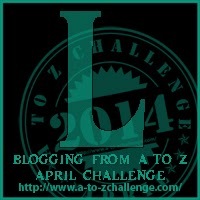 Next installment for Paths to death and also Blogging from A to Z April Challenge 2014. 14th April - Letter L.
Whoa - I'll definitely return tomorrow to see where his path leads him! Thanks Sue, tomorrow would be time for someone else's journey on their path of death. Come by and check it out. Thanks again Kimberly for visiting my blog will definitely check your blog. Nice to meet and connect through the AtoZ challenge. That path seems to be without detour. I'm also participating in the A-Z Challenge and my theme focuses on books and the titles of them, which will begin with the letter of the day! Thank you very much for stopping by and commenting.